The most extensive redesign of award-winning ship Crystal Symphony has been revealed after a multi-million-pound makeover. Some smaller staterooms have been converted into penthouses, new dining options introduced, decor refreshed and technology updated in a move that Crystal claims means ‘the world’s best is now even better’. The most noticeable changes have been made to restaurants, World of Cruising learned in a visit to Barcelona to visit the refurbished ship. 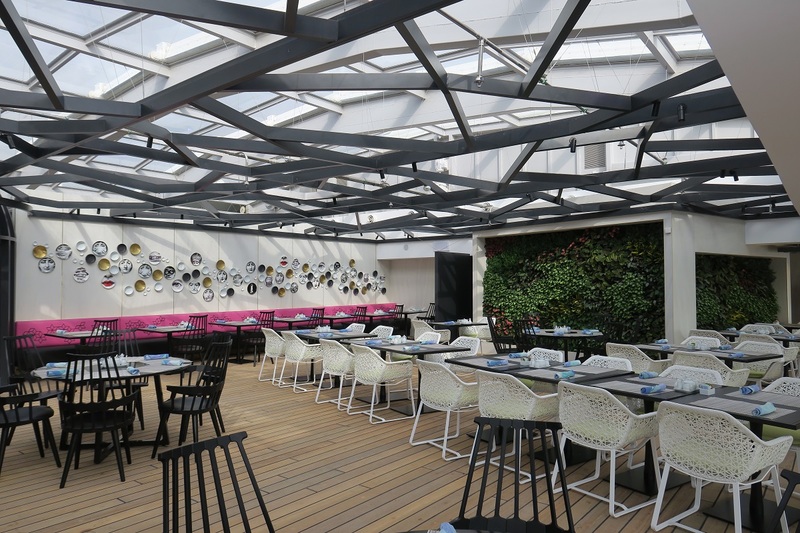 A new venue called Silk, next to the Trident Bar & Grill on the Lido deck, offers modern Chinese-inspired food with sharing plates for dinner and self-service options for breakfast – such as dumplings, porridge and savoury crepes – and lunch including dim sum, noodles and soup. ‘Living walls’ covered with plants are watered by satellite from London. A bar next to Silk is still being constructed. The Crystal Dining Room has become Waterside with more tables for two and four and open seating for breakfast, lunch and dinner. The Lido Cafe is now the Marketplace, serving buffet breakfast and lunch, which then converts into a churrascaria, or Brazilian barbecue, at night. Tapas, salads and seafood will also be offered. Silk Road and The Sushi Bar, featuring the food of master chef Nobu Matsuhisa, have been rebranded as Umi Uma, the Japanese word for Crystal’s logo seahorses. In accommodation, 28 new Seabreeze penthouses and 12 Seabreeze penthouse suites have replaced smaller staterooms, meaning Symphony will now carry 848 guests instead of 922. A doubling of satellite internet speed means all Crystal guests will receive unlimited free WiFi. They will also be able to use interactive TVs to book dinner reservations, shore excursions, spa treatments and room service. Crystal Serenity will receive a similar overhaul in October 2018, with 36 new penthouses and two penthouse suites, reducing its passenger capacity from 1,070 to 980. Luxury brand Crystal touts its all-inclusive package as being ‘all exclusive’ with complimentary fine wines and premium spirits, soft drinks, room service, golf lessons, art and computer classes and gratuities all covered as part of the fare.